A fun project for confident beginners and intermediate quilters looking to stretch their skills with new techniques. 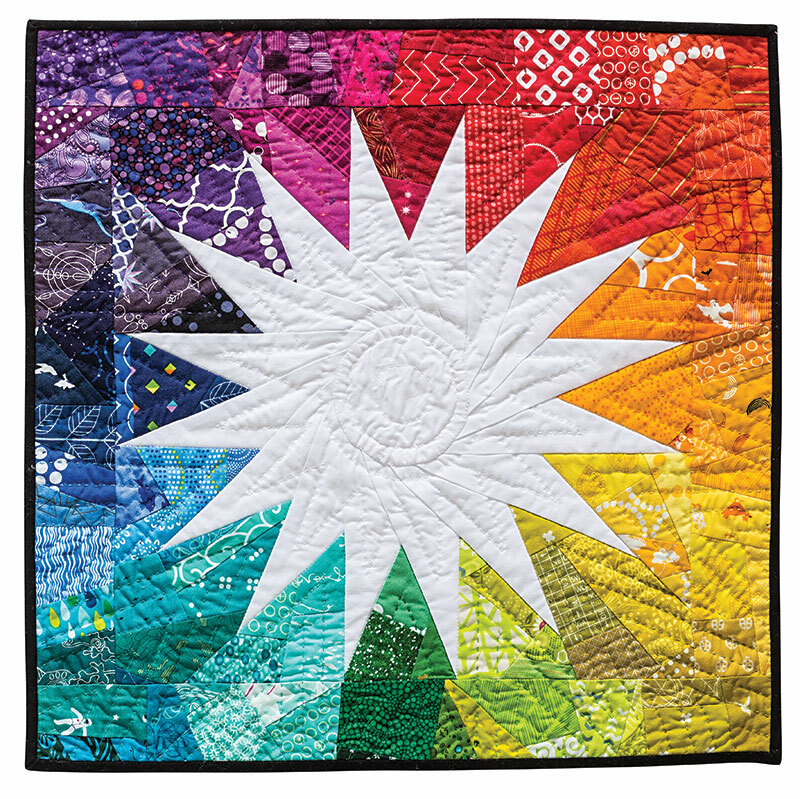 Students will learn to create improvisationally pieced fabric and then use this fabric in a paper-pieced project to create a striking modern mini quilt. This class works best as a series of two class sessions of about 3 hours each: on Day One, students learn improvisational piecing and are then responsible for finishing the improvisationally pieced sections at home. On Day Two, students learn foundation paper piecing and how to finish their quilt. Ideally, each student would have a small pressing and cutting station next to their sewing machine to minimize the need for movement between workstations. Instructions for Rainbow Sun are found on pp. 38–41. Have students begin making improv-pieced sections in the colors and sizes listed in the project instructions. You may wish to encourage students to have fun swapping and sharing scraps. Students should finish the improv piecing, including the border sections, at home. Go over foundation paper piecing and the meaning of the numbering. (See instructions for paper piecing on p. 103.) Demonstrate how to align fabrics for proper coverage of the foundations. Demonstrate how best to join multiple paper-pieced sections together. Before adjourning, be sure to demonstrate how to make and attach the center circle appliqué piece. If desired, go over quilting (especially quilting options for negative space) and binding.